Slow this am. Night before last (too late), I'd discovered the Lipizzaner Stallions were up in Loveland (about 52 miles away). Didn't know they'd be here in Denver tonight, and bought tickets for me and Mom and off we went (I drove) through holiday traffic at rush hour. Urgh. The show was wonderful. With two horses able to do one Air Above the Ground, including the excellent capriole. The announcer said the capriole was to allow a rider a quick escape from footsoldiers, but anyone could see that it was to kick heads in on the way out...or maybe not heads, kicking chests in would be good enough, too. I saw these gorgeous horses up close etc. 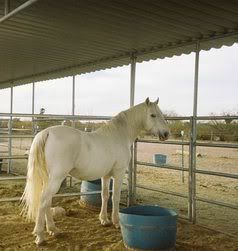 on my Horse Farm trip, and I used Lipizzaners as models for the volarans in my Luna books, as well as having Lipizzaners themselves in Protector of the Flight. But it was fabulous seeing them perform. It did occur to me that if performances of dressage and military patterns were what audiences were used to in Europe in the nineteenth century, then Buffalo Bill and his Wild West Show must have been a real eye-opener. So, except for the traffic and getting lost in the wilds of Larimer County at 10 pm on the way home, all was good, but I'm pretty tired this morning, haven't written on Heart Match yet, and allowed myself to sleep in. But I REALLY hate it when Diva brushes her whiskers against my face to wake up. HATE it. A bath and slow, hot day is waiting for me, and my desk, as usual looks like a bomb has exploded. I think there might be a four inch square spot of free space on it. Maybe. And I count 4 mugs, a glass, and a Pepsi can within easy reach, including the celedon one I'm drinking from -- which leads me back to Judith Tarr and her beautiful celedon china at the horse camp. See above. May research be fun for you today. Buffalo Bill was greatly appreciated by all! You can check on the accounts of newspapers of the time wherever he visited in Europe. Legendary! The police forces in different countries use/used horses to control crowds, at soccer matches, political rallys, etc... very frightening to be on foot and look up to a rearing horse. Is that Pooka's pic, Robin? Anonymous. Right on both counts, and Moon, you're right, too. It's Pooka.